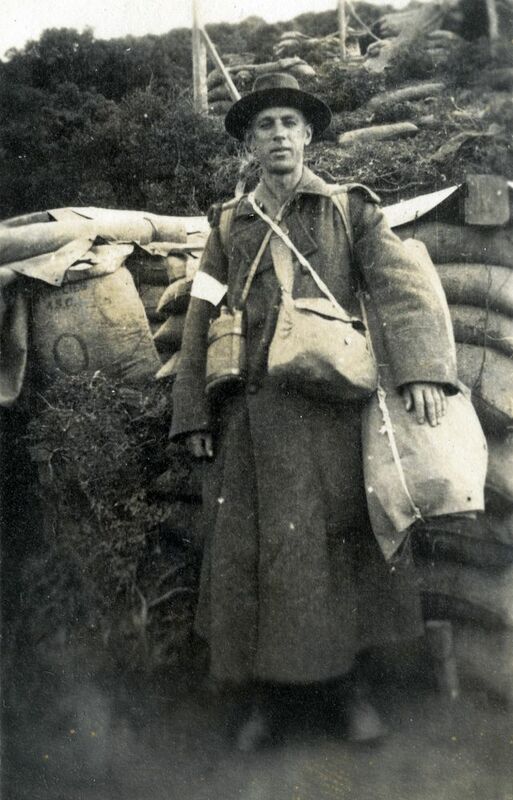 Norman Prior, with his worldly goods, ready to leave Gallipoli, December 1915. Norman Prior was a Masterton doctor who enlisted in the NZ Medical Corps in 1915, service number 3/1243, departing with the 7th Reinforcement and serving in the last weeks of the Gallipoli Campaign. Although Australian-born in 1882, Norman came to New Zealand with his family in 1893. His father served as minister at Masterton’s Wesleyan Church for several years. After training in Dunedin and Edinburgh, Norman took over a general practice in Masterton in 1909. He married in 1913 but his wife Elizabeth died shortly after the birth of their son Arthur in December 1914. Norman returned to Egypt with the Gallipoli survivors, serving at the N.Z. hospital at Ismailia until the N.Z. Division embarked for France in April 1916. Soon after he became the medical officer with 1st Otago Battalion. In that role he was at the Battle of the Somme, where he was awarded a Military Cross for treating wounded under fire in September-October 1916. The Division went north to Flanders and Norman was slightly wounded in June 1917. After a bout of illness for which he was treated in England in late 1917, Normanm was transferred to the No.1 New Zealand General Hospital at Brockenhurst, in southern England. This was his posting until war’s end. He joined a staff of New Zealand doctors, nurses and orderlies responsible for treating New Zealand wounded and sick from the Western Front. He returned on the Ruahine as medical officer, repatriating New Zealand troops. Norman resumed his Masterton practice and married Jessie Miller in 1920. The Priors had three children. Norman remained in Masterton the rest of his life, only retiring as a doctor in his eighties. He died in 1967.